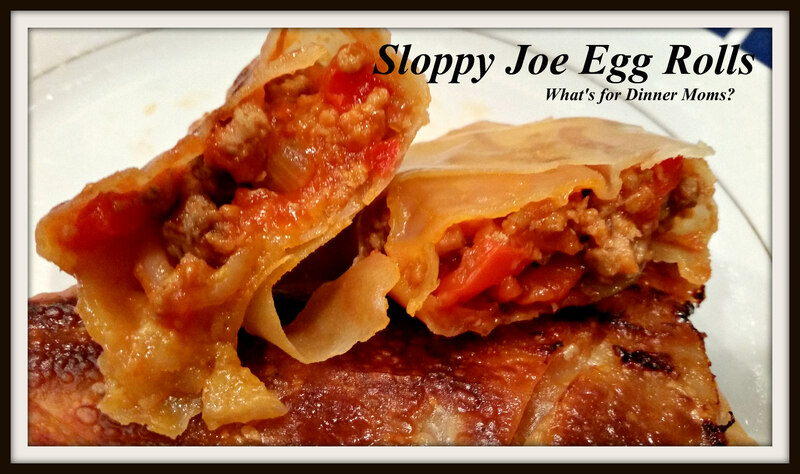 Baked Turkey Sloppy Joe Egg Rolls – What's for Dinner Moms? So Feis (Irish dance competition) season has officially started for us. 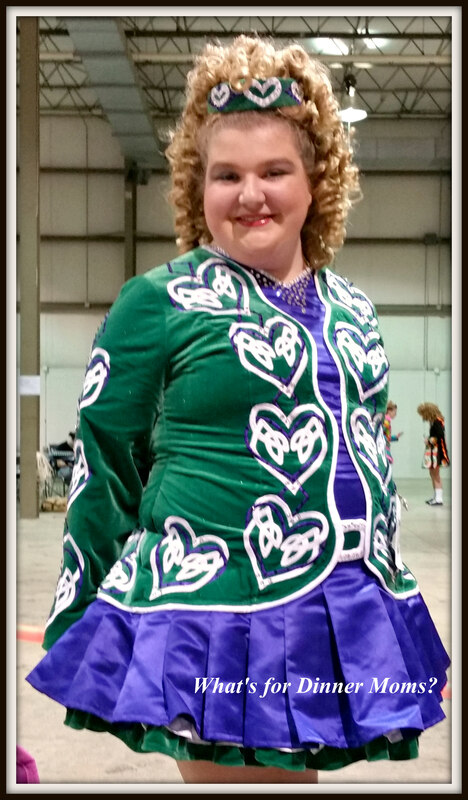 We attended the Dayton Feis in Dayton, Ohio. This was the first time for us attending this Feis. It was in a large airport exposition warehouse which meant there was lots of room and it didn’t feel crowded at all. We didn’t get to see much of Dayton other than the fast food restaurants and the airport but we did find a great little Italian “joint” for dinner the night before the Feis. We have already made plans to return next year. So, my daughter did not do as well as she wanted to in this Feis. She has been practicing and taking extra private lessons over the last month after taking a few months off to just attend two classes a week. The work is starting to pay off but is not quite there yet. I kept thinking how this is in life. It is tough to keep fighting when you don’t see the results of your work paying off. She has it a bit harder too as she is moderately-severely hard of hearing. She wears hearing aids but can’t wear them for dance as they pick up all the sounds not just the music she wants to hear. So all the loud bangs of the hard shoes around her are amplified even more if she wears her hearing aids. Unlike some forms of dance she cannot hear the beat often because there is no bass. It is violins, flutes and accordions accompanying them. Because her hearing loss is mid-range that is where these instruments are heard so she dances to the counts in her head. I am extremely proud of her. I don’t think she has a clue how difficult what she does really is. No, she has not gotten as far as she would have liked, yet, but she isn’t ready to give up yet either. I kind of think of that like my dinners lately. I have not been greatly inspired because of time constraints and traveling but I am not ready to give up my goal of making different dinners at home weeknights. The mojo will return again but for now I am heading back to the tried and true dishes I know my family loves. These were really better than I thought they would be. I was able to sneak in a few extra vegetables, that would be for me not the children. The turkey meat had great flavor and the outside of the egg rolls were nice and crunchy. Serve this with a green salad and or a vegetable for a complete meal! Pre heat oven to 350 degrees. Prepare two rimmed baking sheets by covering the bottom with parchment paper. In a large skillet over medium heat cook the ground turkey and carrots until meat is just cooked through and carrots are softening. If there is any grease spoon it off. Add onion and peppers to the pan and continue to cook and stir meat mixture until peppers are softened and onions are turning translucent. Add vinegar, brown sugar, Worcestershire sauce, and dry mustard to the pan and stir well. Allow to cook for 15-20 minutes until the mixture is thick and most of the liquid has evaporated. Taste mixture and adjust spices as necessary. Add salt and pepper to taste. I also tend to add a splash of extra vinegar because that is what my family likes. Have a small bowl of water to seal your egg rolls. Wrap according to package, using meat mixture and cheese to stuff them, sealing with water to close. Place egg rolls on rimmed baking sheets and brush both sides with olive oil. Bake for 20-25 minutes turning the egg rolls over after 15 minutes. You want both sides of the egg rolls to be brown and crunchy. Remove pan from oven and allow to rest for 5 minutes before serving. I am in awe at your daughter’s tenaciousness, and also very proud of her accomplishments. I can only imagine trying to compete without hearing most of the sound. And the sloppy joe egg rolls sound delicious! What a great idea! Thank you! She doesn’t even realize how difficult and special her dancing is. She will never be a World Class Champion but she dances with her heart and that is so important to me. Yay! And I love this idea! Wow. Your daughter is truly an inspiration! I’ve never had sloppy Joe’s in an egg roll. I’m intrigued! My kids liked them because they could pick them up! No fork required. What an impressive young woman! Amazing Marci!! Thank you! I think she is pretty terrific. You did a great job Marci! Really so many accomplishments and she lets nothing stand in her way! Tell her no worries. Each time is an opportunity to be better. How awesome! Thank you! She is already practicing for the next Feis next weekend. Thank you for your kind words. That’s all she can do. Love it!